Now that the Best Actress Golden Globe Drama race has been topsy-turvy-ed by the HFPA ruling that Alicia Vikander of “The Danish Girl” And Rooney Mara of “Carol” are LEAD and not Supporting considerations, it leaves the Best Supporting Actress field WIDE open. The unexpected turn of events is totally justified in that both Vikander and Mara are playing leading roles. But who does that open the door for now that Supporting Actress is a half-empty glass? Well, I hope they consider the legendary Indie Queen Parker Posey for Woody Allen’s “Irrational Man.” Parker is playing a very horny mid-life chemistry prof who has a BIG drinking as well as a BIG man problem. She’s just delicious in it and has never been nominated. Critics weren’t kind to the film, though I, for one, totally loved it. It’s lack of a high-profile is a bit of a problem, but if campaigned properly Posey is LONG over-due for a nod. And Hollywood loves a good, drunk role. And they LOVE Woody, and they love the way he ALWAYS writes great Supporting Roles for women. Who does that? Almost no one. Also someone who’s never been nominated, but who’s just great in “Love and Mercy” is Elizabeth Banks,as the only normal person who is front and center in this crazy mash-up of a film about the Beach Boys’ Brian Wilson. Her performance on Saturday Night Live last night reminded audiences of how funny and versatile she is and high-lighted her directing skills, too, in a very funny opening number, in which she also sang! And danced! Talk about triple threats beating the band! Another look-alike blonde Rachel McAdams may have her Oscar day and get swept in with the buzz surrounding the super-hot front-runner “Spotlight.” As a serious investigative reporter, McAdams is taking a 180 degree-turn in her career with this dramatic movie. I’ve loved her in Woody Allen’s “Magic in the Moonlight” so I have a warm spot in my heart for her. Maybe the Academy does too. And they WILL see that movie. AND she’s doing that tricky Boston accent. Sometimes just being in the right movie at the right time is all it takes to get a Supporting Actress nomination. Witness Jacqui Weaver’s less-than-stellar turn in “Silver Linings Playbook.” She was swept in with the tide with that one, a nomination for a performance so lack-luster NO ONE was predicting it. That could happen to Joan Allen, a great actress in my book for “Room.” She plays Brie Larson’s conflicted mother. And she’s GOOD. But not great. She’s been nominated before and they may just write her name down as force of habit.But she won’t win. Another familiar name(and face) keeps popping up. It’s Oscar winner already and Hollywood legend Jane Fonda for a five minute spot in “Youth.” Performances this brief don’t usually get noticed but this year the pickings are PRETTY slim. And they all know and love Jane. Also in a teeny tiny role is the always nominatable Meryl Streep in “Suffragette.” Doing a thick high class British accent as Women’s Rights heroine Emmaline Pankhurst, she gives the film a jolt in her also five minutes worth of scenes. Also good in that movie is previous nominee Helena Bonham Carter. Another comic actress getting serious. 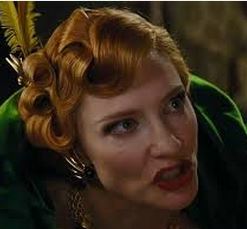 Another familiar Oscar winning face may just be Cate Blanchett, who may turn up in this Supporting category for her all-out camping as the evil stepmother, but with depth, in “Cinderella.” Wouldn’t it be ironic if because of her TWO great lead performances this year in “Truth” and “Carol” that she cancels herself out and splits her own vote? Especially since it looks like she is going to be sharing the Best Actress category with co-lead Rooney Mara. Wouldn’t it be the HEIGHT of irony if Disney’s real life, non-animated “Cinderella” is where she gets in this year’s Oscar race? Don’t laugh. This could really happen. And the Oscars are always the height of irony, aren’t they? Well, sometimes.